Such pleasure there is in the light of the Sun! This key is one of celebration, joy, and accomplishment. The naked child rides the white horse of pure solar energy triumphantly from the walled garden cultivated human consciousness. The four sunflowers face the child, not the Sun behind them, indicating the elements of Fire, Air, Earth and Water are paying attention to the child’s actions. The child represents yet another step in The Fool’s journey toward enlightenment. Like The Fool, s/he wears a wreath and a red feather in her/his hair, signifying s/he is gaining spiritual victory over the lower aspects of humanness. The nakedness indicates there is nothing to hide. Controlling the horse only with body movements shows the child has reached a balance between the conscious and unconscious mind. 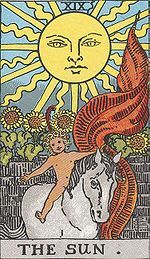 The red banner in the child’s hand denotes action and purpose of thought related to the Sun’s light (opposite of the reflective, quite light we saw in The Moon). Note the banner is in the child’s left hand, an indication that purpose is driven by our unconscious mind. This Key reminds us that, when we are who we really are and are willing to share ourselves in gentleness and kindness, the world can be a joyous place. Speaking our truth quietly puts us in balance with All That Is, and within ourselves. There is joy in the process of coming into the Light. I love reading your blog, thank you for taking the time to write it. I have only started looking into Tarot recently. I have a deck called The Golden Tarot by Liz Dean. I picked my deck by looking at the available decks at my local book store and picking the one that felt right. My question is; I have not read where you consider it a different meaning if the card is reversed. Does a reversed card (upside down) mean something different? The opposite?